Man tries to cash stolen check at Suntrust Bank in Sebastian, Florida. SEBASTIAN – On Monday afternoon, a homeless man tried to cash a stolen check at Suntrust Bank in Sebastian. Police said the bank was alerted after the same individual tried cashing a check in Vero Beach. Ivel Hopkins, 54, was charged with Felony Utter Forged Instrument and is still being held at the Indian River County Jail on $5,000 bond. 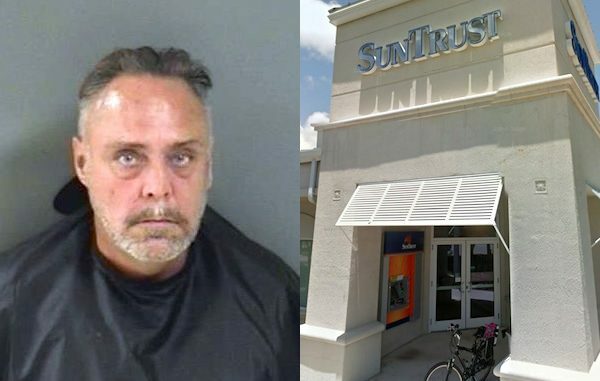 Suntrust Bank, located at 9601 U.S. 1 Highway (at the corner of U.S. 1 and Barber Street) told Sebastian Police that Hopkins handed a check to the teller. After running the check through the system, the teller realized the bank account associated with the check had recently been flagged and put on alert for possible fraud activity, according to the arrest affidavit. The teller notified the manager and then called law enforcement. Police arrived within minutes and spoke with Hopkins. Hopkins told police that he’s homeless and was sitting on the curbside when he was approached by a man who goes by the name Jay. He asked Hopkins if he wanted to make some extra money by cashing a check for $2,900. The first attempt in Vero Beach failed, so Hopkins tried it again at the Sebastian Suntrust. “The defendant confessed to the fraudulent check and attempting to cash it out. When asked if he knew Jay, the defendant stated he just met him today and was trying to earn some cash,” the officer said. The check was from a business called F. Browne Gregg Insurance Trust. The owner told police that his office had been burglarized over the Thanksgiving weekend and some of their checks were stolen. The insurance company had placed alerts on all of their accounts so no one could cash any checks out.